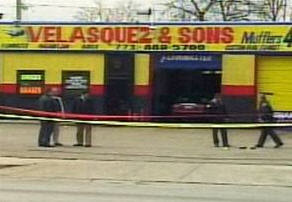 Last week, Ruben Carate, 18 attempted to rob the Velasquez and Sons muffler shop in Chicago. Unfortunately, Ruben arrived at 8 in the morning. The employees told him that at that time of the morning, they had little cash and could not open the safe. No sweat. Just a little inconvenient. Ruben gave the employees two phone numbers where he could be reached and asked them to give him a call when the owner came in. Then, Ruben could return and try to rob the place again. They called Ruben later that day. Ruben returned wearing the same clothes and mask and brandishing the same gun as before. This time, the Chicago police were waiting for him. Ruben was shot in the leg during the attempted robbery. He is recovering well and is under arrest for attempted armed robbery and aggravated assault of a police officer. Ruben probably thinks that his big mistake was not changing his mask. 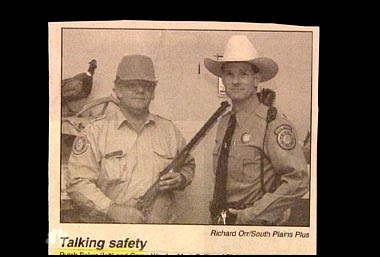 This actually happened during a Carson City council meeting. The woman who "attacked" the "victim" was originally arrested... but this video and eye witnesses set her free. 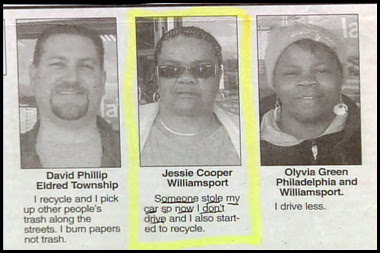 The question these people were asked was, "What do you do to help the environment?" Robert Salisbury recently received an unusual phone call. While away from his home in Oregon, a woman called and asked Robert if it was "OK" to take his horse. Of course it wasn't OK. Why ask? The woman was responding to a fake ad on Craig's List (an internet "classified ads" site) which stated that everything in the Salisbury home was free for the taking. Robert returned to a home that was quickly losing its contents. He stopped one man with a truck that was filled with his stuff, including ladders and lawn equipment. 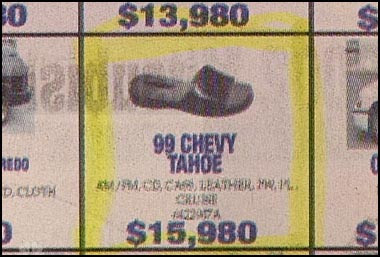 When confronted, the man in the truck refused to return the items, citing the Craig's List ad. Jacksonville police have notified the public that Robert's property is not up for grabs and anyone caught with his things will face prosecution. 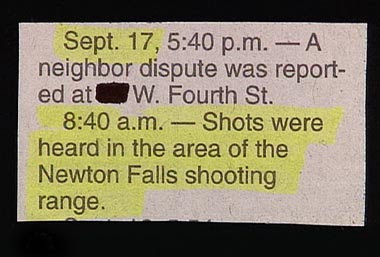 Oddly, this is not the first such incident. 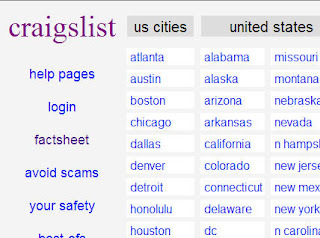 Last year in Tacoma, Washington, a woman's home was ransacked and stripped because an ad was placed on Craig's List telling people that the contents were free for the taking. I was looking at some optical illusions and was fascinated by these two. 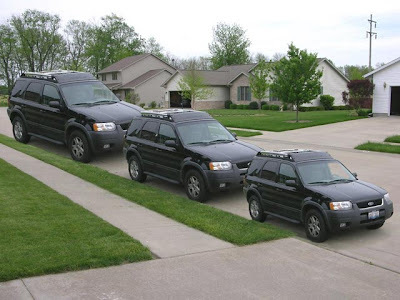 If you don't believe that the cars are the same size, take out a ruler and hold it up to your screen. As for the second one, I couldn't even find what the illusion is. Read it. Look at it. If you can't see it, click on "comments" below. I will leave the answer there. Liu Lian of Datong city in China found the perfect man to date her daughter. His name was Li Zhanyu. 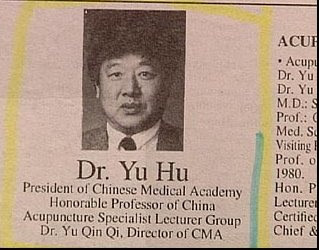 He was university educated and a major in the Chinese army. He also had ties that could give her daughter a good job. Maj. Li Zhanyu said he wanted to date Liu's daughter (and eventually marry her), but unfortunately, he was committed to another woman. To satisfy the commitments he made to the other woman, he needed approximately $22,000. For Liu Lain, it seemed like a good deal. For $22,000, her daughter would get a respected husband and a good job. So, she sent Li Zhanyu the money he needed to satisfy his commitment. Unfortunately, after Liu sent the money, Major Zhanyu disappeared. Realizing she had been probably been cheated, Liu reported the situation to the authorities. The police caught up with Li Zahnyu at an internet cafe and arrested him for fraud. When he was arrested, Zahnyu was incensed. He said, "You'll regret this. You'll pay for this. I'll call the leaders of the National Public Security Department." hmmmm..... The police noticed that Li had a rather high voice for a man. It was at that point that they learned that the conman was actually a conwoman. 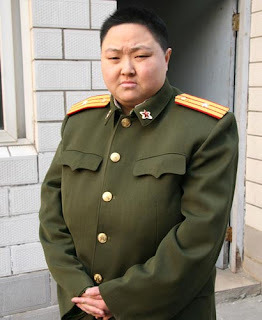 Major Li Zahnyu's real name is Li Xu... a woman who had been disguising herself as a male army officer for the past two years. She has confessed for cheating at least two others out of money by using the same marriage ruse. She is facing charges. a real estate agent that tells the absolute truth. I asked her what the house would cost. She said, "dodi pedz! woma pake fqpc idym uflu vghud dirm;"
driver, would you please arrest me and take me to jail? If you are going to rob a store, it is a good idea to have your own car for the get-away. This week, two teenagers in Oakville, Ontario, Canada robbed a convenience store and stole an undisclosed amount of money. Then, they fled on foot and hid in a nearby wooded area. They believed that they had made a clean get-away. That is where their plan fell-short. 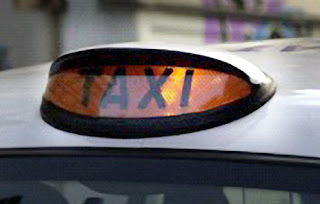 Meanwhile, the police had been tipped-off that the thieves were on foot and alerted the taxi company to inform them if they got any suspicious calls. When the call came in to the cab company, two police officers drove the taxi to the wooded lot. The young men got in and confirmed that they had called for the taxi. The police placed them under arrest and drove them right to the station. Detective Sargeant Kevin Mahar said, "Obviously not having a getaway vehicle or anything like that and calling a cab is generally not a sign of your most sophisticated criminal." but would it offend anyone to simply say that a black armband is black? 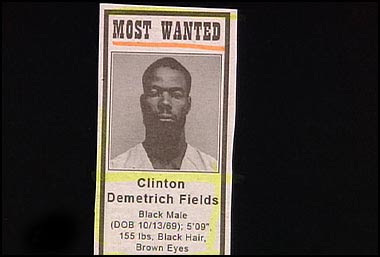 Clinton Demetrich Fields is shown as one of the "Most Wanted" men in Alachua County, Florida. 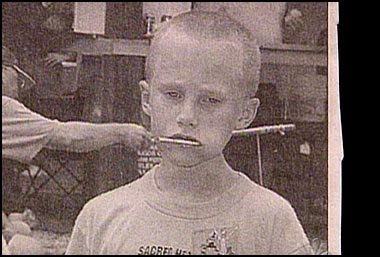 No word on whether or not this photo has led to his arrest. 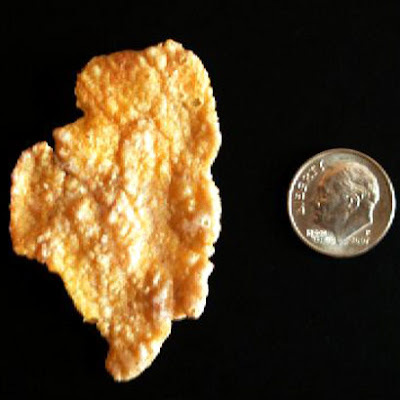 hmmmm... despite Ananova's report that I cited yesterday, several other reliable sources report that the Great Illinois Corn Flake actually sold on Friday for a scant $1350. Making it a 682 pound (British) flake. Still, a pretty good chunk of money for a frosted flake. I am still selling my Wyoming Hershey bar for those interested. 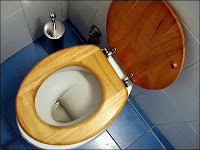 Have you ever wondered what would happen if you pushed the emergency button at a gas station? 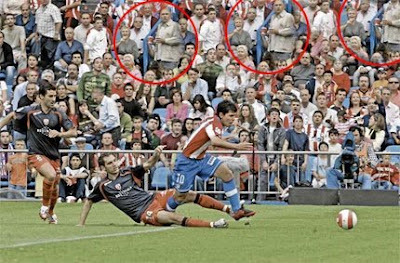 Watch the guy in the blue striped shirt, who did this accidentally. Most normal people like dog hair when it is actually being worn by a dog. But once it leaves the animal, we think of it as a nuisance. After all, dog hair fills the brush and clogs the drain. 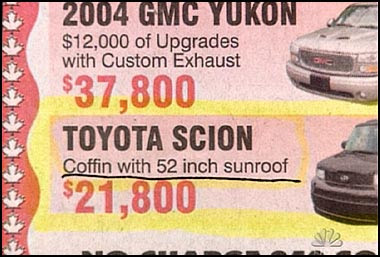 It gets embedded into the carpet. It collects in the corners of the dog-bed. Well, here's an idea: why not clean the brush and comb the hair out of your carpet... and then make a pull-over coat with it? If Rover doesn't shed enough, you can wait for him to die and then use all his hair to finish your project. What an idea! Just think of the coziness. Think of the warm memories you'll have of your loving pet. Imagine your smell on a wet day. Imagine the other dogs wanting to sniff you. Sound like a bad idea? Not according to Beth and Brian Willis. It seems that Mrs. Willis saw Princess Diana wearing a dog-fur coat one day and thought "Gee, I what a good idea. I can make my Brian one of those." And she did. 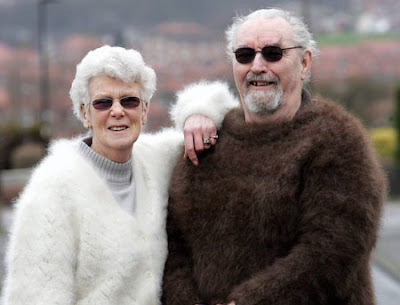 She first made a sweater for her husband from hair they collected around the house. That was such a success that when their Swedish Lapphund died, they made another jumper out of her. 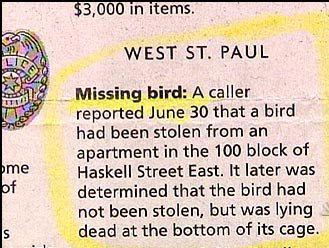 thanks, Robert, for alerting me to this story. these guys really did this. the officials weren't happy. 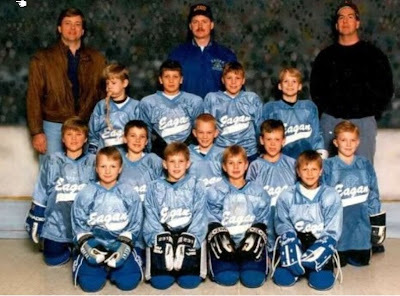 The person in the back is playing with a stick of some sort. 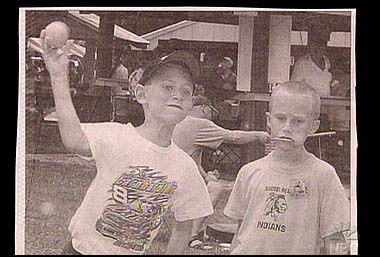 The boy is eating a lollipop... but it was a perfect picture. Since I posted his story a week ago, I thought you might like to see the video. or not. It seemed like a romantic idea at the time. A London man named Lefkos Hajji, wanted to "pop the question" to his fiancee, Leanne. Literally. His idea was to hide her $12,100 diamond engagement ring inside a helium balloon. 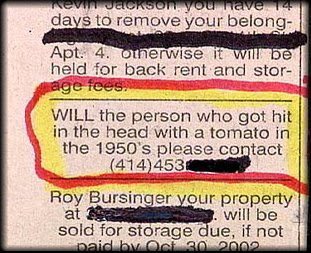 Then, he would present it to her and "pop" the question. Now, some of us see the obvious danger in hiding a ring inside a helium balloon. Lefkos didn't. 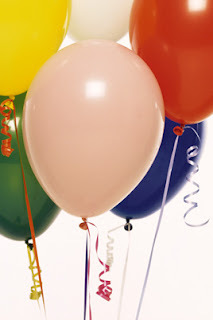 After leaving the balloon store, a gust of wind swept the balloon out of his hand. Like a bad dream, Lefkos saw her ring (and his money) floating calmly away in a balloon. He tried to chase it in his car for two hours, but it soon became a mere dot vanishing on the distant horizon. Said Lefkos: "I just watched as it went further and further into the air. I felt like such a plonker." Leanne, 26, has shown what a worthy bride she will be. She is not speaking to Lefkos until she gets a new ring. I am not sure what a plonker is, but I am guessing that Lefkos should go with his feelings on that one. 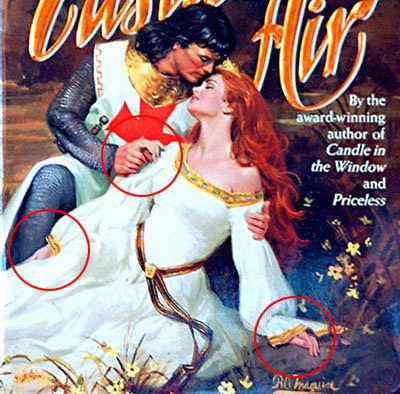 1. from a romance novel book cover - notice the mutant third hand on the woman. 2. from a Spiderman movie promo - Kirsten Dunst's right, um no, left arm would need to be five feet long and have two elbows to make this picture work. 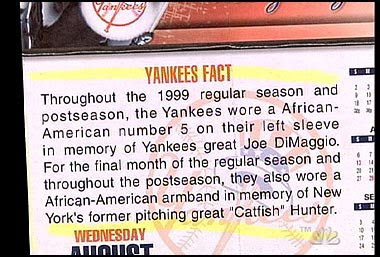 3. from a sports feature - the crowd apparently had lots of sets of identical triplets in it that day. Last week, a man in Liberty, Pennsylvania sat in his car for 20 minutes, waiting for just-the-right moment to execute his plan. His plan was to rob the Citizens and Northern Bank of Liberty and get away without a hitch. Shortly after noon, he pulled his ski mask over his face, picked up his rifle, and headed to the front door of the bank. It was a bold plan: robbing a bank single-handedly in broad daylight. The man approached the front door of the bank and pulled on the handle to open it. It was locked. That branch closes for lunch for an hour every day at noon. The man quickly retreated to his car and drove away. 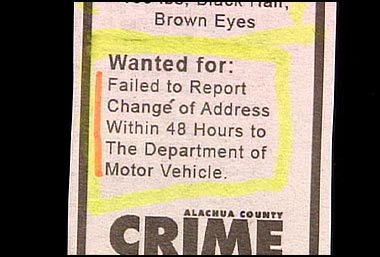 Unfortunately for him, some bank employees spotted the attempt and wrote down his license plate number. The 28-year-old man was tracked down by police and thrown in jail. He is being held for $50,000 bail. Although this site is supposed to be pointless, I do, at times, want to share wisdom. Please read these four insights and give them careful thought. With the first sip, joy. With the second sip, satisfaction. With the third sip, peace. Do not wish for perfect health, or a life without problems. "Where the heck is that stupid remote?" "Honey, have you seen my car keys???" A team of scientists in Japan have recently invented a pair of glasses that are able to answer those questions for you. The glasses have a miniature camera installed and recognition software on board. The glasses record everything that the wearer sees. Then, it can use the recognition software to locate any objects that have been recorded. 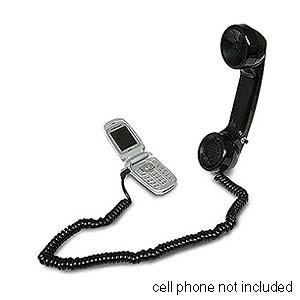 For example, if the wearer loses his keys, he can say, "Where are my keys?" The software then searches though its video log and accesses the last point where it spotted keys. Then, the glasses can play back that section of video where the keys were last seen. Today, the glasses can be trained to identify any number of objects. Eventually, the glasses will be even more intelligent than the wearer, being able to recognize things that he doesn't. 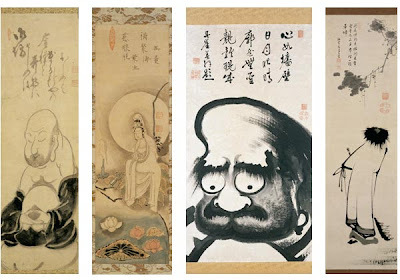 According to inventor Professor Yasuo Kuniyoshi, the glasses are still too large for everyday use but are being miniaturized for that purpose. Where did I put my stupid glasses? I thought this was interesting. Try to count how many passes the white team makes. But now, there's a new one: asparagus. 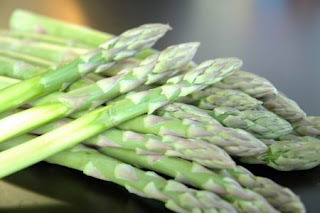 Jemima Packington of Worcester in England claims that she can tell a person's future by looking at how asparagus lands after it is tossed in the air. She refers to herself as an "asparamancer" and says that she learned of her gift when she was a child. Ms. Packington is showing her technique at the British Trade and Travel Fair this week. Asparagus is too expensive. Try broccoli. my pointless is now available in a format suitable for mobile phones. Point your phone browser to http://feed2mobile.kaywa.com/202185461. A few months ago, I posted a story about the man with the longest leg hair. 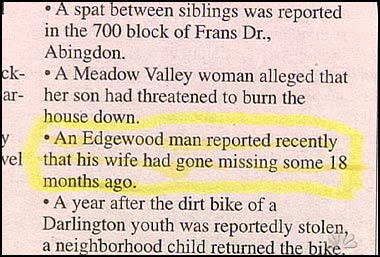 Does news get any more significant than that? 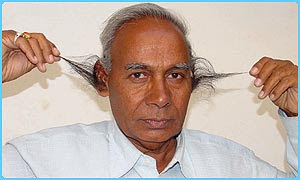 According to Ananova News, the people at Guinness World Records have established one man as having the longest ear hair. That's right. He has many lengthy keratinous filaments flowing from his external auditory meatus. His name is Radhakant Bajpai of northern India. The 50-year-old Bajpai has hair flowing from his ear that is 5.2 inches long at its longest point (yes, the picture is him). Will he clip it now that he has the record? Not a chance. He sees his ear-mane as a gift from God. The uses special shampoo on it and refuses to wear anything that might damage it. He can even make his ear hair into small pony tails. In an interview, Mr. Bajpai said, "Making it to Guinness World Records is indeed a special occasion for me and my family. God has been very kind to me,"
I wonder if he has to wax it. These were taken from two different papers about two different safety programs. 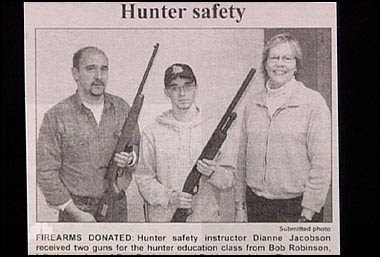 Remember: try not to point your gun at the head of the instructor. 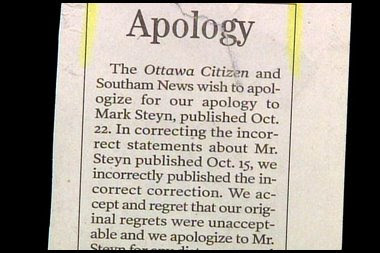 thanks for clearing it up for us. Those who know me know that I don't like to fly. This video is amazing but doesn't encourage me to enjoy flying. The pilot deserves an award. 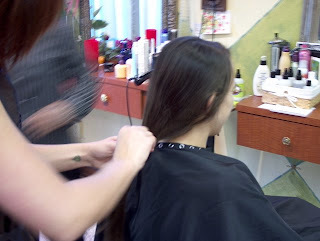 Last Tuesday, Lauren Newton of Washington, PA went to get her haircut at the home of Monique Reed. Unfortunately, Ms. Newton didn't like her haircut and complained to her stylist. Most stylists would respond to a criticism by offering to fix the problem or perhaps not charging the customer. After hearing the complaint, Ms. Reed promptly got a gun and fired two shots: one into the ceiling and the other into Newton's lower back as she fled. Newton was taken to the hospital and will survive the haircut and the gunshot wound. Reed, on the other hand, has been charged with assault and is being held on $50,000 bond. really, Monique, I like the whitewalls around my ears and the divot near my cowlick. They are unrelated stories but have one lesson to be leaned: when attempting to steal something, do not carry large objects that announce you as the thief. The first story happened back in January when a woman in Sweetwater, Tennessee was found lurking around a church at night. 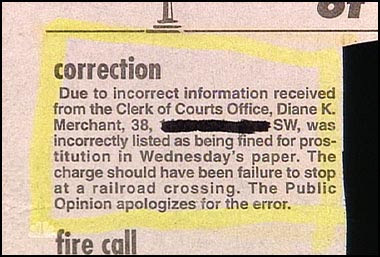 When stopped by the police, Jennifer Hunt, 35, was asked to produce some identification. At that moment, a crowbar just happened to drop out of her pants. She also carried a screwdriver in her pants. Hunt claimed that she was behind the church relieving herself and could not understand why pry marks that fit her crowbar were found on the rear door of the church. In a second and unrelated story, last week, a German man was arrested for shoplifting a suit. He tried to hide the suit by wearing it under his street clothes. 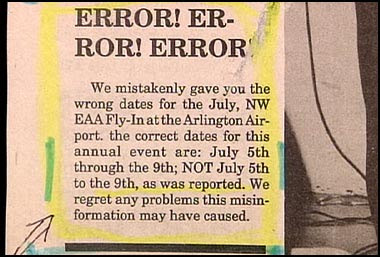 His mistake? He forgot to take the suit off the hanger. One police officer observed, "Only a sign saying 'stop me, I'm a thief!' would have made the thief look more unprofessional." 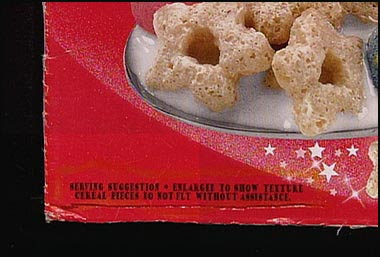 Cereal pieces do not fly without assistance. I know. it's gross. just gross. 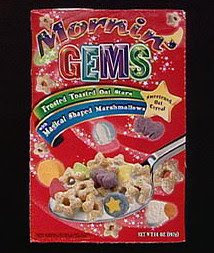 But think of this as a theme post... the post above also has flying cereal in it. But now, there are at least 51 ways. Mr. Che, of Yinko City in China has started a new business to help couples break up. For a mere 124.70 yuan (about $17.50), Mr. Che will pass along the information to your ex-to-be that your relationship is kaput. finito. done. He tries to be kind and compassionate, but he makes the message clear. He also tries to explain to the now-jilted person why breaking up is best. Mr. Che says that he will not do married couples, disputes over money, or tell lies. Why does he charge such an odd amount? 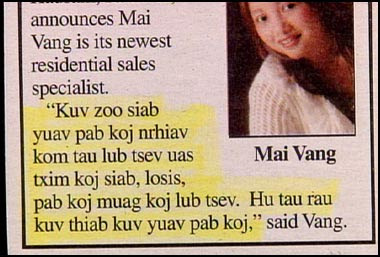 Because in Chinese, the pronunciation of the amount sounds a lot like "let love die." Here are some signs that have been posted in Japan to discourage people from smoking in public places. If you don't understand the slogan, the diagram is not an improvement.